Have you stopped writing “2018” on everything yet? If so, that must mean January is wrapping up. And what a January it was! Between Boston Marathon bowling kick-off events (see right), check presentations, and Saturday morning water stops (Go Team JAF! ), the Joe Andruzzi Foundation started off the year on the right foot. But that’s not all that has kept us busy so far in 2019 – read-on below for a recap of January in the JAF-world. Kelly, her husband, and their two young daughters piled into the car for the ride to the airport. The Cassier family was Disney World-bound – their first ever family trip. That’s when Kelly saw she had a message on her cell phone. It was from her doctor, asking for her to call immediately. At that moment, Kelly knew life had changed. She was about to learn she had breast cancer. 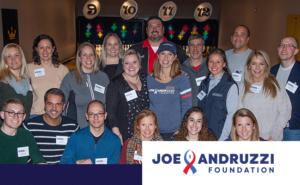 With just 74 days remaining until the Boston Marathon, our 2019 Team JAF runners are entering the final stretches of their training and fundraising journeys! 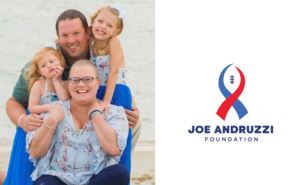 To date, the team has raised more than $65,000 towards its goal of $185,000 – all in support of JAF’s mission of providing help, hope, and a reason to smile, for New England cancer patients and their families by contributing financial support when it is needed most. 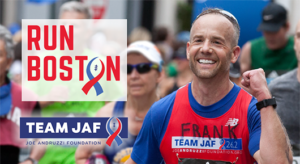 To learn more about our 2019 Team JAF Boston Marathon runners, or to make a donation, follow this link! Empower Rounds Goal Line Giving Donation Up To $25K! 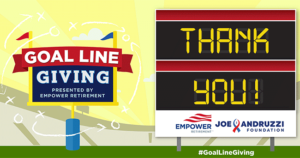 Last September, we kicked off year-three of a campaign in partnership with Empower Retirement, who pledged to donate $50 towards the Joe Andruzzi Foundation’s Financial Assistance Program for every point New England scored during the regular season. After a successful year filled with plenty of touchdowns, the Patriots scored a total of 436 points – equaling a donation of $21,800. However, Empower’s generosity didn’t end there…that’s why we’re THRILLED to announce that our good friends and supporters at the retirement services provider have decided to round up their end-of-season Goal Line Giving donation to an even $25,000! We are so grateful for Empower’s generosity and are humbled to participate in such an impactful partnership for a third year in a row. Thanks to Empower Retirement, and the value they see within JAF’s mission, we can now reach out to more families to relieve some financial stress so they can focus all of their energy on battling cancer! Learn more here! 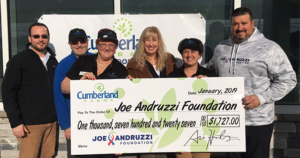 From December 20 through January 17, the North Attleboro Cumberland Farm’s location – right next to the JAF office – pledged to donate 10 cents from each dispensed beverage to the Joe Andruzzi Foundation. The tallies are in…and we’re thrilled to announce that the campaign raised $1,727 – all in support of the New England cancer patients and families we serve. Thank you, Cumberland Farms, for your generosity and commitment to our local community!